In case you’re completely and utterly paranoid about all of the many things that can go wrong which could drag you into either a civil – or, heaven forbid, bankruptcy – court, its time to ease your anxiety with some helpful advice for reducing your risk of being sued. • Develop a Written Inspection List – Similar to the preventative maintenance one in Chapter 14, a well-constructed list can help you eliminate any problems before the tenant moves in. And for those of you that have been inclined in the past to casually sweep items under a rug, when it pertains to the safety of others, you don’t want to turn a blind eye even to the smallest of items – spending a few dollars now may save you a million or two later! • Create a Safety Notice – This can either be a letter that the tenant can acknowledge receipt of upon moving in or a displayable notice that can be posted in the utility room, garage or common areas if it is a multi-unit complex that instructs the tenant to immediately notify you of any problems, repairs or concerns with regard to their personal safety. Reminder letters can also be included anytime you correspond with the tenant by mail for any other reasons. • Document Everything! – As stated before, you need to maintain a file on each tenant and on the property as a whole. Every complaint that is made needs to be recorded in a logbook of some kind, which should either be stored on your computer or kept in some type of physical form (for all of you Rolodex hold-outs!). Each entry should be accompanied by a description of how it was resolved or handled and include copies of any applicable receipts. The more you can show that you are not a neglectful landlord, the better you’ll appear in the eyes of any judge. 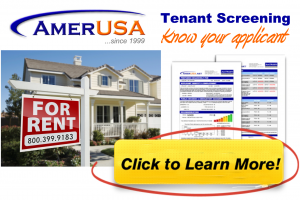 • Tenant Checklist – Just in case your notices are ignored, another suggestion is to create a checklist for the tenant to fill out quarterly or semi-annually concerning any problems that they may be aware of, either within or outside the property. There should be a spot on the checklist for the tenant to sign and date. This is an extremely good way to protect yourself from ever being accused by a tenant of neglecting a long-standing problem. • Don’t Discriminate – It’s sometimes too easy to innocently and unintentionally ask the wrong questions – or perhaps say something that may be considered discriminatory. In order to prevent yourself from being sued and prosecuted for violating civil rights, you must always remember that the Fair Housing Laws prohibit a landlord from being influenced by one’s race, color, religion, gender, familial status, disability, medical condition, sexual orientation, involvement in a government assistance program or age (unless it is a senior citizen community). So there’s absolutely no reason to get so stressed about reducing your liability, to the point of developing an obsessive compulsive disorder or stroke or anything even close. Ironically, even attorneys often find themselves getting sued over the same common problems about which they regularly lecture their clients. Just do your best and be conscientious not to ignore legitimate complaints or problems. Even if a tenant seems to be overreacting, you need to at least address their concern and dignify it with a response explaining why a repair isn’t necessary or why they may be responsible. If you’ve never worked in customer service before, this may be a good opportunity to take a part-time position at your local thrift shop for the experience – or, in all seriousness, to at least remember that being an “American Landlord” is largely a customer service job.